In the long row of bright-red taxis queued up at Washington's Union Station on a recent morning, a cab sporting a bright-green "e" stood out. District of Columbia officials and environmentalists have celebrated the city's electric cab fleet as a weapon against climate change. But a largely immigrant corps of taxi drivers who are struggling to compete against ride-hailing services like Uber and Lyft say the program has stuck them with a hefty tab for environmental progress. "We are suffering because of this car," said Tsegaye Mamo, a cab driver from Ethiopia. "This car is not good for business." The Department of For-Hire Vehicles, which encouraged cabbies to join the electric taxi effort in 2016, failed to prepare them for the rough road ahead — notably, an acute shortage of charging infrastructure, E&E News found in interviews with 11 electric-cab drivers. The drivers — most of them immigrants — say they didn't understand the difficulties and expense of owning and operating an electric cab. 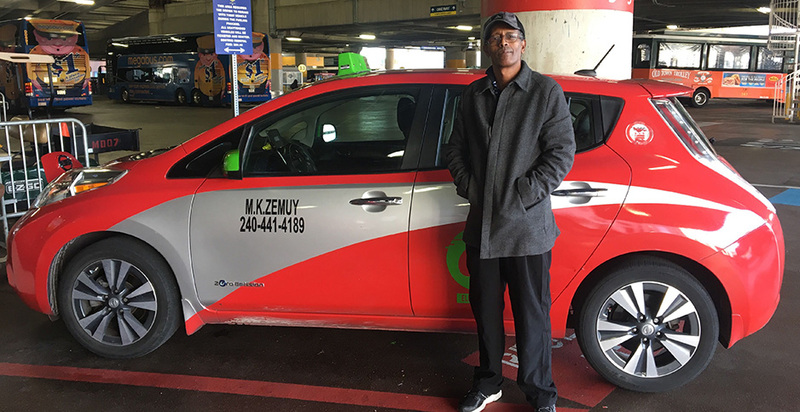 While the Department of For-Hire Vehicles dangled $10,000 grants to cover the cost of new electric vehicles and lure drivers, many cabbies said they either didn't receive the grant or are still paying off loans for the car. "I don't know why they forced us to buy this car," said Mesfia Tesfaye, who came to the United States from Ethiopia nine years ago. "It is very hard." David Do, the department's interim director, maintains that the drivers should have done their homework. "I understand it's difficult. I feel for them," Do said in an interview. "[But] the grant guidelines were clear from the beginning that, 'Hey, if you do accept this program, you have to be in this vehicle for at least three years.'" Drivers say they didn't realize that charging an electric vehicle sucked up so much time — which in the cab business is money. While filling a gasoline tank takes just minutes, charging an electric car takes around half an hour. And drivers say they need to charge two or three times a day. "Now is my second time charging today," said Asmare Aemiro. "I just went in the morning and now again." "With gas, you fill up once, you can work all day," he said. "So which one is better?" Alan Dowdell, vice president of business development at ChargePoint, the country's largest network of EV charging stations, said he thinks the plug-in stops offer cabbies an ideal lunch break. "You know, there are natural breaks that a taxi driver has to take to eat lunch and stuff," Dowdell said. "You could replace 100 miles of charge pretty easily during a 30-minute lunch break." But on a recent winter afternoon, just one driver was eating lunch while his battery charged. The rest killed time by looking at their phones or napping as earning opportunities passed them by. Most District of Columbia cabbies said they earn $80 to $120 a day. The average D.C. taxi driver makes $38,872, according to Salary.com. By contrast, the director of the Department of For-Hire Vehicles makes $177,295 a year, city records show. Many drivers said they feel pressure to maximize their earnings by working longer hours. Sometimes, they feel compelled to pick up passengers even when their battery is low. That's a risky move. Five drivers said they've had to call a tow truck after their battery died on a trip. "The last time I went to Dulles Airport, I had to get towed," said Nuru Shafi, referring to the northern Virginia airport that's about 45 minutes away from downtown Washington. "The batteries ran out. I could not find a charging station. Finally, I called the tow truck. It was so cold. I was crying," Shafi said. "That was a nightmare for me." There's just one charging station in the District of Columbia that's available to cabbies at a reasonable price. Most Americans who own electric vehicles charge them at home, but that's an expensive proposition. Installation of a home charging station can cost $500 to $700, while labor and parts can cost $1,200 to $2,000, according to HomeAdvisor, a digital site for home repair services. D.C. has 103 charging stations, but most are on hotel property, in private businesses or in parking garages. That means they're reserved for patrons or off-limits to cab drivers unless they pay a parking fee. Companies that supply electric vehicle equipment are looking to invest in more urban charging stations. In the District of Columbia, Potomac Electric Power Co. (Pepco) recently filed a $15 million request with the D.C. Public Service Commission to expand charging infrastructure in the region. The request includes a proposal to install two chargers for taxis and ride-hailing services. "We recognize that Washington, D.C., has the opportunity to be the leader in electric taxicab service in the country," said Rob Stewart, manager of smart grid and technology for the Exelon Corp. subsidiary. "We hear what those drivers are saying, and we want to help them out." Pepco hopes the commission will approve its request in time for installation this spring or summer, Stewart added. Noah Garcia, a transportation policy analyst at the Natural Resources Defense Council, said cities around the country must commit to building out more charging infrastructure, with an eye toward equity and accessibility. "If we're going to promote and sustain an EV market that's broader and more diverse," he said, "we're going to have to think more comprehensively about the needs of people who don't have access to charging in their homes." Compounding the problem, EVgo recently closed down a charging station outside a Giant supermarket where cabbies used to congregate. Jonathan Levy, EVgo's vice president of strategic initiatives, declined to comment on the record about why the charging station was closed. But Do said he heard EVgo received too many complaints about overuse by cabbies. Union Station is now the only remaining option. The Department of For-Hire Vehicles subsidizes the two fast chargers in the garage there, and all 11 cabbies interviewed for this story said they primarily charge there. "It's only here now," said Aemiro, gesturing at the Union Station garage. "Before, when we bought these cars, we could charge at two or three places. But now everywhere is closed." Another cabbie who requested anonymity said he wished he had known about the lack of charging options before going green. "There are not enough. That's a big issue for taxis," he said. "So I don't think D.C. is really ready for electric taxis, because the infrastructure is not there." When the Department of For-Hire Vehicles rolled out the electric taxi program in 2016, it solicited applications for $5,000 and $10,000 grants to cover the cost of a new vehicle, which has a sticker price of about $30,000. The department received 56 applications and doled out 45 grants, spokesman Neville Waters said. But the total number of electric-taxi drivers in the District is 127, he said. That means 82 drivers are operating without grants, either because their applications were denied or because they didn't apply in time. "They promised, but they did not give," said Mekkonen Kassa, a driver from Eritrea. "They lied. They told us we'd get grants of $10,000. They did not give them to us." Lemmesa Hunde, another driver from Ethiopia, said it's unclear why his application for a grant was denied. "They told me the government was going to give us $10,000," Hunde said. "They denied me. I don't know why. It is a problem how some people got it and some people didn't." Another cabbie who asked to remain anonymous said he received a $5,000 grant, but he nonetheless struggles to support his wife and two children. His wife works in a supermarket. "It's not enough. Believe me, it's not enough," he said. "This is a $30,000 car. If I knew this would happen, I would never put $30,000 in this car." Do, the department's interim director, said: "It's a competitive process. With any grant system, not everybody is awarded a grant. But it's more than that, you know? There's limited funds." He added: "If I could give everybody money to get an electric vehicle, that's something that I want to do. But we're a government agency. We don't have that much money overall. So, you know, we have to do a competitive process, and we have to seek out the best proposals." 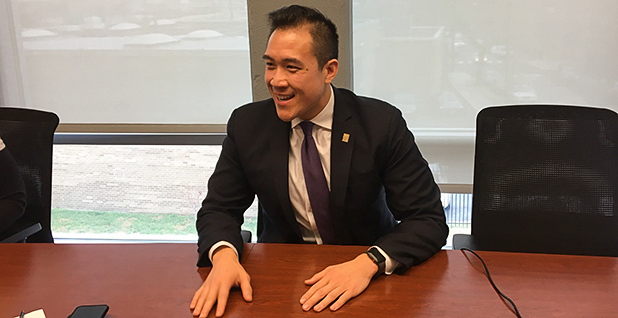 Do took over as For-Hire Vehicles' interim director in November, taking the helm from Ernest Chrappah, who led the department for more than two years. Chrappah earned an award for his work on the electric taxi program as well as a promotion from Mayor Muriel Bowser (D). And at a September 2017 conference in Austin, Texas, the International Association of Transportation Regulators gave him its top award. In a news release, the association credited Chrappah with "creating the first-ever electric taxi program in DC ... that increased awareness of climate change, generated fuel cost savings, and reduced [carbon dioxide] emissions." 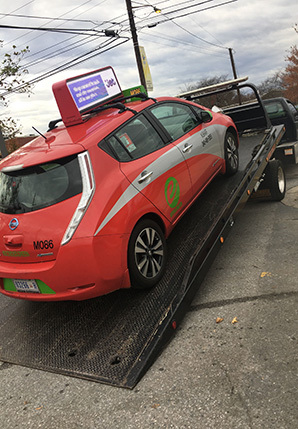 At an October 2017 meeting of the D.C. For-Hire Vehicle Advisory Council, Chrappah proclaimed the electric taxi program a runaway success. "No other jurisdiction within striking distance has made this type of commitment to the for-hire vehicle industry," he said, according to a transcript. But Shafi accused Chrappah of misleading the drivers. "It's because we are foreigners. That's the reason Mr. Chrappah, he doesn't respond," Shafi said. "He treats us like foreigners, like second-rate citizens. But I'm an American citizen right now." Chrappah was recently promoted to interim director of the D.C. Department of Consumer and Regulatory Affairs. The department declined to make him available for an interview. "Director Chrappah has been out of the office and will not be able to respond by your deadline," spokesman Timothy Wilson said in an email. Asked how he would respond to allegations that the Department of For-Hire Vehicles misled drivers, Do said he thinks the cabbies should have done their research on the different types of EVs. The vast majority of drivers opted to buy the Nissan Leaf, which costs around $30,000 and has a range of roughly 100 miles. But, he said, they could have chosen the Chevrolet Bolt, which costs about $36,000 but has a range of roughly 200 miles. Newer Tesla Inc. models boast ranges of more than 300 miles, although their prices stretch from $49,000 for the Model 3 to $94,000 for the Model S.
"You know, there's a myriad of options," said Do, who drives a Tesla. "And sometimes, one vehicle might be cheaper than the other. But there are costs and benefits to that." He added, "These rules and guidelines came before my time, and it's my job to adhere to what was laid out three years ago." A group calling itself the D.C. Electric Taxi Cab Operators Coalition recently sent a letter to Bowser and D.C.'s representative in Congress, Del. Eleanor Holmes Norton (D), accusing the District of "unfulfilled promises." The group wants permission to transfer from electric vehicles to gasoline-powered vehicles, which is prohibited under current rules. Kassa is one of the cabbies who have had enough. "I just decided to quit, to sell my car, because this is not the right car to own," he said. "An electric car for a taxi is not right." A man who identified himself as the coalition chairman declined to be interviewed for this story. "I don't want to speak about this headache," he said before joining the long red ribbon of cabs outside Union Station, indistinguishable from the other cars save for a small green emblem.